Pure vacuum tube headphone amplifier and can also be used as a preamplifier.It adopts the classic SRPP circuit, which has been famous for its very low background noise. Its sound output is full of analog style especially for high-impedance headphone. This is the newest headphone amplifier in 2017 designed by Nobsound and Little Bear. 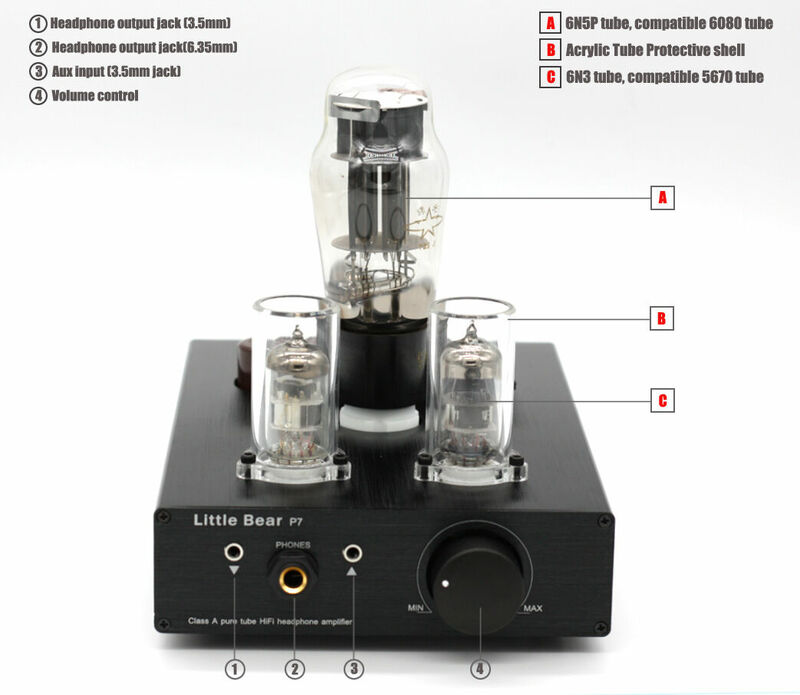 It is a pure vacuum tube headphone amplifier and can also be used as a preamplifier. This product adopts the classic SRPP circuit, which has been famous for its very low background noise. Its sound output is full of analog style especially for high-impedance headphones (more than 200 ohm). Using a SMPS (Switching Mode Power Supply) instead of a normal transformer. Via boosting and filtering, it can achieve the same performance while still keep the compact dimension. Dual headphone output (6.35mm/3.5mm), have Stereo L/R RCA and 3.5mm AUX dual-type audio input, with Stereo L/R RCA output can do as Preamp. This is a 50W class A vacuum tube amplifier. After working for about 1~2 hours, it is normal that the device may be relatively hot. We recommend taking a break every 1~2 hours. While using the 3.5mm jack on the front panel as input, the RCA input on the back panel will be disconnected. While both the 3.5mm and 6.35mm are connected with headphones, the RCA output will be disconnected. 1. For initial starting, the device needs 5~10s to warm up. While starting, there may be a blue LED shining for about 3~5s and then it would be steady. 2. Please do not use this device for long time. Taking a 10-minute break every 1.5~2h working would be recommended. 3. This device is a 45W Class A Vacuum Tube Amplifier. It is normal that the shell is relatively hot after working for one hour. 4. The attached power supply of this device has a resettable protecting function. If you can’t start the device, please remove all power connection and reconnect them. 5. It would be better to use high-impedance headphones (40~600 ohm). It is not suitable for 12~36 ohm headphones. 6. A 3m black wire is also attached to be connected with the ground. It is used for some players that can’t be matched well with this device, which may cause a little background noise. Please use the wire to connect the device’s power input with the ground wire or mental items in the room.